Mexican damiana is a small shrub; the long, broad, obovate, toothed, light green damiana leaves have few hairs on the rib; frequented by reddish twigs. Damiana is a small mint-like plant bearing fragrant yellowish-white flowers. Plant has a warm, bitter, camphor-like taste. Found in dry places in Texas, Baja California, and northern Mexico. 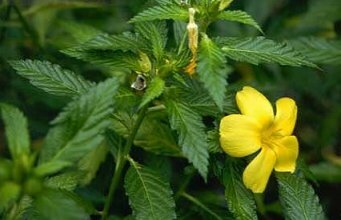 The Mexican damiana is considered the Mexican aphrodisiac and tonic. Damiana is a delicate scented herb used alone or in wine and liqueur compositions as bouquet garni. Damiana seems to be considered as something of a natural “upper”, to be taken for nervous and sexual debility. It is reputed to have aphrodisiac properties. It is also prescribed for spermatorrhea (involuntary emissions) and for treating orchitis, a condition resulting in atrophy of the testicles. Treats frigidity in women. Improves digestion, migraines, a laxative, relieves anxiety, promotes a feeling of well-being, cystitis, depression, inability to concentrate, cures constipation. A brain and blood tonic. It is usually taken in a 1:1 mixture with saw palmetto berries. Infusion: steep 1 tsp. leaves in 1 cup boiling water. Take 1 to 2 cups per day. Fluid extract: take 15 drops to 1 tsp., 3 times per day, before meals. Capsules: take 1 capsule for up to 3 times daily before meals. Powder: taken 3 to 6 grains, 3 times a day, before meals. Damiana leaves are available from herb dealers. Also, obtainable in capsule form. Damiana stimulates beyond the limit of our safe and healthy resources; may have ill effect on the heart. Use this herb with medical supervision.